Take charge and know how to deal with your bipolar child properly. Set a consistent sleep-wake schedule. Regulating his sleep-wake schedule will help avoid circumstances like difficulty getting him to bed and waking him up to go to school. The discipline should continue even on weekends. Plan in advance. Awkward situations can trigger meltdowns. If unavoidable circumstances arise, be prepared. 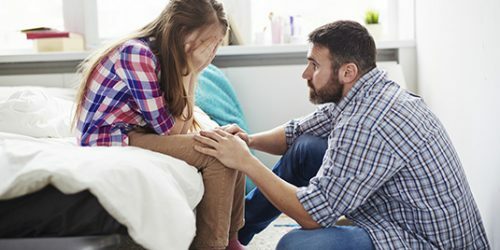 In case your child becomes violent, be sure you have a crisis plan which includes strategies to calm him down, taking away harmful things, numbers to call, and knowing which hospital you will bring him to. Keep a journal. Taking notes of his mood swings can help you identify patterns and triggers in his mood. It will also improve your awareness of early warning signs. Warn him ahead. If there are some transitions that will happen, inform him ahead of time and prepare him. Give him time to adjust at his own pace. Praises motivate your child. Encourage him to use his energy in doing something productive. Appreciate his good behavior and achievements. Always be in contact with the school. Be attentive because school and peers can be will have an outburst while in school or by the time he gets home. Take time to talk him out of it. Teach him techniques on how he can manage them. Be updated with the latest happenings in your child’s life. As he grows older, peer pressure also increases. He can be more exposed to alcohol and drugs. Keep track of his activities. His impulsivity can put him in trouble. Listen to your child. When he gets excited or agitated, just let him talk. Listen carefully and patiently. This means a lot to him. Healthy family environment. Limit family conflicts and arguments. Stress destabilizes your child’s mood. Be creative in putting limits and restrictions and be consistent in reinforcing them. Avoid being aggressive and don’t appear controlling. Involve him in resolving some issues to improve his problem-solving skills and decision making. Avoid arguing in front of your child. Never compare your bipolar child with his siblings. Put on extra effort to explain to other siblings the situation. Make them understand his special needs. Be sure your home is bipolar child-friendly. In case of violent behaviors, be sure knives and other pointed and harmful objects are out of reach. Keep his medications where they can be accessed easily. Put up notes and positive words on the walls to serve as reminders. Take care of yourself. It is essential to care for yourself. Raising a bipolar child is stressful and can make you feel detached to the world as it eats up most of your time. You’re not only taking care of him but also your spouse and other kids. Find support. Be with family and other people close to you who understand your situation. Consider going to therapy yourself and attend support groups. You need it to recharge. Draw strength from other parents who are going through the same ordeals. Every child is a gift and so is everything that he is. Bipolar or not, raising a child requires time, patience, understanding, and love. Taking charge of a bipolar child is not all stress and frustration. It can also be fun getting yourself involved in his activities. He may have his mood swings and downsides, but with your guidance and encouragement, he will learn to cope with it. This entry was posted in Facts About Bipolar Kids, Treatment and Management. Bookmark the permalink.